He gives no further details. Was it a retirement party? For how many retirees? Who worked for how many years? Pickup offers no hint. Unless he omitted some nefarious details, his complaint shows poor judgment: a hair-shirt approach that unnecessarily undermines trust in government. Is it unreasonable for government departments to spend money celebrating the retirement of long-serving employees? Is $25/head too much? How much would be OK? $20? $10? A Taco Bell gift certificate? Shall we form a committee of $100,000-a-year managers to work up policy on every conceivable type of employee recognition and celebration, then send it up the line forDeputy Ministerial approval, before disseminating it throughout the department, with training sessions for any who might be involved in implementation, and spot checks to ensure the limits are not exceeded? Is this how we want civil servants to spend their time? Or shall we hire people we trust to do their important and necessary work without subjecting them to public shaming for making reasonable decisions that would pass unnoticed in most large organizations? Here’s another example. Without naming the department or offering any pertinent details, Pickup complains about a “senior executive dinner” with unnamed “external parties,” five people in all, that cost $304. Back out HST and a 15% tip, and the meal comes to $46 per diner. That’s an entree and a glass of wine, no appetizer or dessert, at one of the Halifax dining establishments where you might take visiting executives or government officials. But Pickup knew the $304 dinner tab would be catnip for Province House reporters. This isn’t auditing the books. It’s show-boating for the media and fostering populist resentment—reckless indulgences in today’s climate. 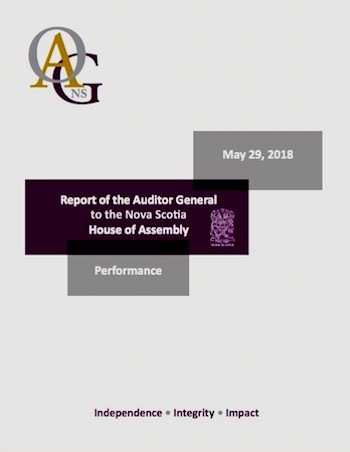 Governing Nova Scotia is a $10.8 billion/year operation. It’s not a church supper, and Pickup should stop channeling a Presbyterian deacon. Next time you hear Pickup wax indignant about government’s failure to implement some forgotten recommendation from four years ago, remember that some AG recommendations are overbearing and mean-spirited. Governments are wise to let them fade away.